"We received our bookmarks and are very happy with the way they turned out! Thanks for the quick and friendly service and the exceptional quality. I was disappointed with an online printing service we ordered from before but you have exceeded all my expectations." These custom holders are made of sturdy 24pt paper stock, and can be printed full color and aqueous coated on one side for a durable finish. Add any custom printing features (embossing/debossing, foil stamping, die-cut elements) for a one-of-a-kind piece that showcases your brand beautifully. They are easy-to-erect, shipped flat and require no gluing or taping. The clean, contemporary design offers a compact and appealing front panel for your custom artwork. Fill these with your brochures, rack cards, or other point-of-sale or educational material. Literature Holders will accommodate approximately fifty 8.5 x 11 tri-fold brochures or fifty 4 x 9 rack cards. Need a custom brochure holder, rack card holder, or other product holder? Of course we can do it! Whether it's an unusual size, the ability to display multiple rack cards or brochures, or simply the need to stand out, these holders can be customized. Don't have a brochure or rack card holder designed and ready to print? You've got options! Don't get held up trying to develop a design for your literature holder. Let our team help you get what you want at a price you can afford. We will work one-on-one with you to guarantee your vision is realized on paper. 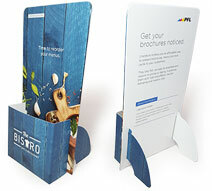 Brochure holders and rack card holders (also known as literature holders or table top displays) provide opportunities for stand out-and stand up-presentation ideas. We can create any custom product just for you. But more importantly, we will work with you to create a piece that functions the way you need it to - helping you grow your business! Use our design templates and instructions to easily lay out your literature holder artwork. Don't overlook how you present the brochures you print and distribute. Proper presentation adds a polished, professional look to your brand and business. Custom literature holders capture attention, giving you an extra edge. Literature holders display your marketing materials right in front of your customers and encourage them to engage. They are perfect as point-of purchase displays and help organize material neatly while getting attention. Literature holders or point of purchase displays can be made of acrylic or various grades of paper stock, ranging from cheap brown corrugated to the fine 24pt material we offer. Typically, acrylic or cheap cardboard holders are generic, solid-color holders that don't feature brand graphics. For more ideas, to receive a custom quote or request free samples, call a PFL Marketing Advisor at 800-­930-2423 or get a price now.